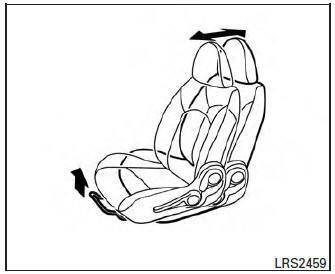 Your vehicle seats can be adjusted manually. 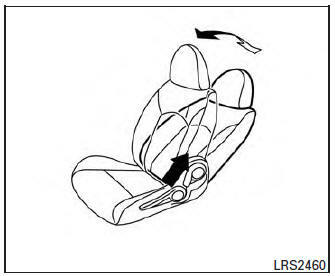 For additional information about adjusting the seats, refer to the steps outlined in this section. Pull the center of the bar up and hold it while you slide the seat forward or backward to the desired position. Release the bar to lock the seat in position. To recline the seatback, pull the lever up and lean back. To bring the seatback forward, pull the lever up and lean your body forward. Release the lever to lock the seatback in position. The reclining feature allows adjustment of the seatback for occupants of different sizes for added comfort and to help obtain proper seat belt fit. For additional information, refer to “Precautions on seat belt usage” in this section. 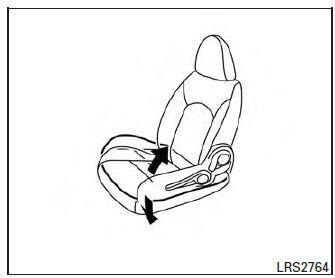 Also, the seatback can be reclined to allow occupants to rest when the vehicle is stopped and the shift lever is in P (Park) or N (Neutral) position with the parking brake fully applied. Pull up or push down the adjusting lever to adjust the seat height until the desired position is achieved.